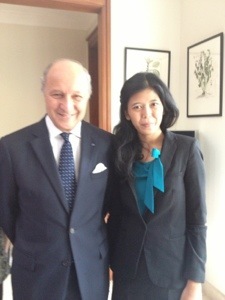 I was so happy when suddenly got a call from the French Embassy to Indonesia. What was it about? It was scheduled on 2nd August 2013 (few weeks ago, I know I post this article too late). So it was on Friday, in fasting month. It supposed to be a breakfast meeting, but well, we finally just spent 1 and 15 minutes for the meeting. Having learnt French and its culture for almost 5 years including a year living abroad in the exact country. I could crown myself in mastering “them”, I mean their behaviors, preferences, and so on. One of them is that they LOVE their language and are so proud of using it anywhere on any occasion. And that’s, that’s true. I was told that the meeting will be held in English with no translator. I was doubting it, especially it was related to diplomacy, where the French are just too enthusiastic to spead their language in front of everybody (litteral meaning). So, I thought, it would make them happier if I used French for my questions. Then I did. And I was the only one who spoke French at that forum among others participants. And, though it was mentioned that everything will be done in English, finally, they’ve (of course!) come along with a professional translator. And the dialogue went this way: 1. Question from a participant, 2. 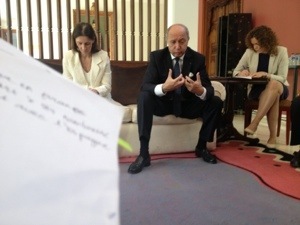 The minister replied in French, 3. The translator took the floor, until five questions. Surething I was impressed with all the exceptional invitees. I was so happy to be able to deliver my questions in French (the Minister said that “Your French is just perfect I’ll give you a Master’s degree right away!” An honour!). That was such a great experience for me!